On Friday, 7/14/17, the Town of Dryden, like other parts of Tompkins County, was affected by flash floods that caused road damage. On Saturday morning the Town Supervisor Jason Leifer, Highway Superintendent, Rick Young, and others in the Highway Department surveyed the damage. In addition, on Saturday our Volunteer Fire Companies helped residents by pumping water from flooded basements. Since Saturday, the Highway Department has been working hard to repair the road damage. According to Highway Superintendent Rick Young the cleanup is ongoing. The Town is also working with the Tompkins County Disaster Coordinator to determine if the damage done county-wide will make Tompkins County eligible for relief funds. For more information on the cleanup effort please contact Rick Young, Highway Superintendent, at (607) 844-8888, option 5. LETS WORK TOGETHER TO KEEP THE TOWN OF DRYDEN ROADS SAFE! The Town of Dryden is the largest township in Tompkins County in road miles and one of the largest in the state outside of New York City. There are 159 named town roads in the Town making a total of 239.68 lane miles of town highways. 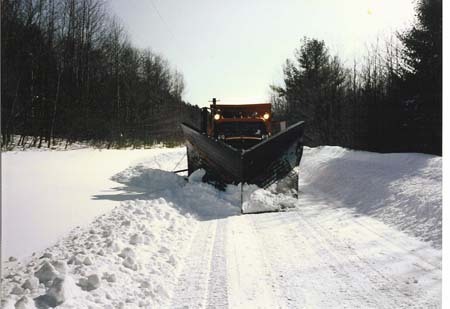 In the winter, under contract to Tompkins County, we plow and sand approximately a .65 mile section of county road (Gulf Hill Road). The Town also plows and sands small sections of roads for the following Towns: Caroline, Ithaca, Virgil, and the following Villages: Dryden, Freeville, Lansing. Roads will be monitored 24 hours a day by law enforcement personnel. When bad weather is expected, the Highway Supt and Deputy Highway Supt, will also be checking the roads. Our goal is to maintain a passable road by plowing and sanding. Motorist should not expect Town roads to be bare when temperatures are below 32 degrees. Drifting snow on windy days is difficult to keep clear when snow has accumulated along the side of the road. Hard & black ice conditions take longer to maintain because snowplow trucks have to drive slower to avoid sliding off the road. Occasionally, mechanical breakdowns, severe weather conditions, and employees becoming ill do slow us down. Motorist should use winter tires or a new set of all season tires during winter months. Please slow down and drive accordingly to the condition of the road. Vehicles or equipment should not be parked on ANY town highways or turnarounds from November 1 – April 30! VEHICLES OR EQUIPMENT MAY BE TOWED AND WILL BE AT OWNERS EXPENSE! It is illegal to remove, shovel, plow, snow blow snow from private driveways across or in the highway. Offenders may be ticketed for creating a hazard to motorist including the Town of Dryden Snowplow operators. If you’ve observed a person doing this please call the Sheriffs Department at 257-1345. The Town Highway policy is not to replace or repair mailboxes damaged by the impact of snow when plowing or because of snow removal. Refer to County Law section 6 and Highway Law section 319 – Snow Removal From Highway. 2) The front of the mailbox should not extend beyond the edge of the shoulder. 3) The mailbox post should be a minimum of 16′ from the center of the road. 4) Mailbox should be clearly visible. All construction work affecting Town right-of-ways require a highway work permit. Eagleshead Road – Between Ellis Hollow Road and Hunters Lane – approximately 6/10 of a mile. Woodland Road – Between Eagleshead Road and the dead end – approximately 2/10 of a mile. Deer Run Road – Between Eagleshead Road and Hunters Lane – approximately 1/10 of a mile. Hunter’s Lane – Between Eagleshead Road and Woodland Lane – approximately 4/10 of a mile. Genung Road – Between Ellis Hollow Creek and Ellis Hollow Road. Approximately plus or minus 1 mile. North Landon Road – Between Snyder Hill and the Town Line. Approximately plus or minus 1 mile. Hunt Grove Road – Approximately 1/10 of a mile. Hunt Hill Road – Approximately 7/10 of a mile from Ellis Hollow Road. Deer Haven Road – Approximately 2/10 of a mile. Pleasant Road – Approximately 1/2 of a mile from Turkey Hill to Deer Haven. Spring House Road – Approximately 6/10 of a mile between Route 38 and Route 13. Yellow Barn Road – Approximately plus or minus 1 mile between Ferguson and Midline. There will be money spent on other town highways as needed to maintain a safe driving surface. Note: all work is subject to change depending on weather conditions, unexpected winter road damage, and material cost increases. Former Highway Superintendents: G. E. Mineah (1915-1921), John Munsey (1922), Frank Ellis (1923 – 1925), George E. Mineah (1926 -1932), Lee Stevens (1933-1934), Stacey Beach (1935 – 1961), Richard C. Case (1961-1975), Gregory Humphrey (1975-1987), Donald Gilbert (1987-1999), Jack A. Bush (2000-2013). Former Deputy Highway Superintendent: John (Jack) Park ( 1976-1995), Randy Riker (1995 -1998), Jack A. Bush (1999) W. Mark Sutton (2000-2004), Randy Riker (2004 – 2012).